One Sunday afternoon, I found my Mom glued to her iPad, totally engrossed in Treasures of Montezuma (the first). A few days later, my sister was hogging it, then her husband, who’d been playing all day. “I can’t stop playing it!” all three invariably told me, pausing only to glance at me briefly. Alawar Games has every reason to be proud of their Montezuma series, a richly detailed world where you race against time to collect jeweled tiles by swapping and forming chains of at least three tokens and eliminating them. The catch here is that you can’t just remove any token to beat the level – you need to eliminate those with a gleaming jewel in the center before time runs out. As levels progress you get to unlock special powers to aid you, such as those extending your time, increasing your bonuses and the like. The game is pretty easy to figure out and consists mainly of swapping tiles to form chains to eliminate them. The beautiful part is in scoring satisfying chain combos and hitting the ultimate Score Frenzy mode. 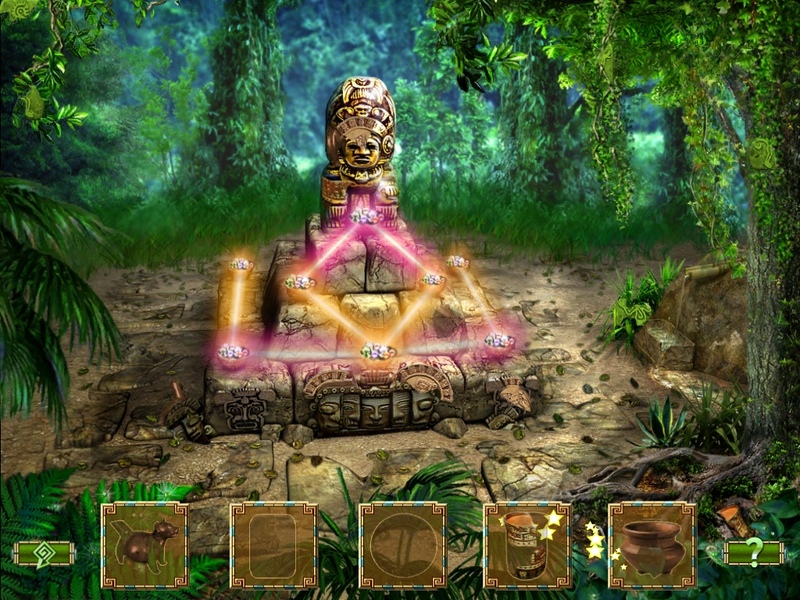 You then earn magic stars to spend on power ups (a mix of color-specific totem idols, board gems and score, time and combo boosts) that you activate in-game by scoring successive combos of chains of the same color. You can vary these power ups at any given time before starting a level to maximize your score. Thus, you can play and replay a level depending on your power ups of choice in many different ways to maximize your score. The power ups upgrade system may seem a bit confusing at first but you’ll figure it out eventually. How you beat a level is ultimately up to you and the strategy you employ – which power up to use and which tiles to prioritize. 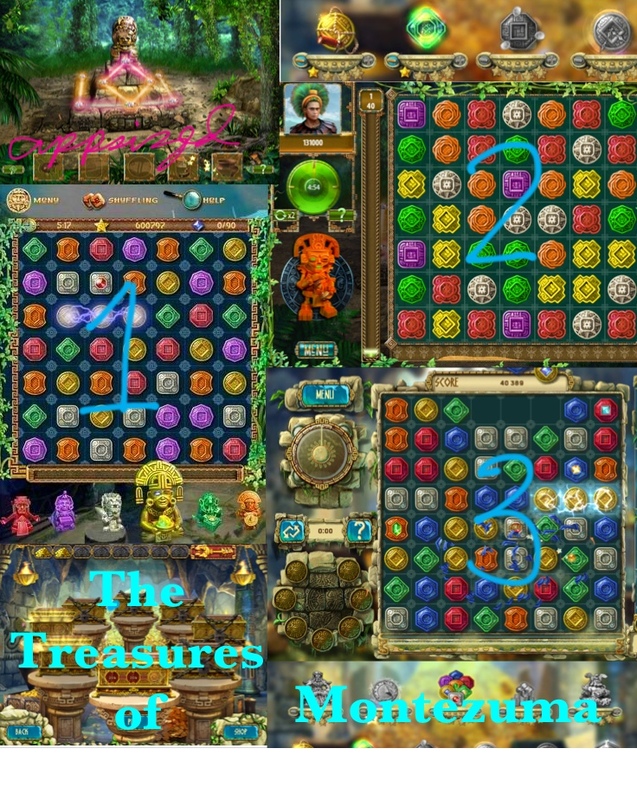 The strategy element makes Treasures of Montezuma more than just a match three puzzle game – it is more challenging and exciting thanks to its clever twists (read the original review). The graphics are simply gorgeous and a visual feast that pays homage to the famed conquistador and his fabled riches. The tokens are colorful, richly detailed and a sheer pleasure to look at. 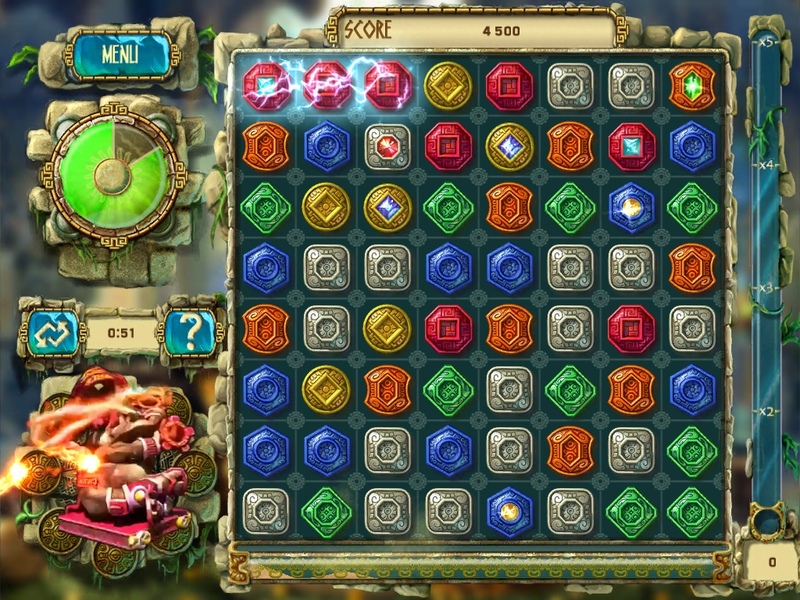 The vibrant visuals and animation are enhanced by the sound effects and music, making a triumphant, satisfying sound for each tile chain formed, and each power up used. TOM sets the standard for its sequels, and boasts of beautiful tokens and larger than life power ups. TOM 2 is more of an in-betweener in terms of graphics, with the biggest tokens of the three but which appear scaled up on the screen. TOM 3 is the most beautiful yet, with the smallest but the most detailed and gorgeous tokens and scenery all around. You’ll also notice that in TOM, the default orientation of the board is portrait mode so you have more tokens to eliminate. TOM 2 and TOM 3 are in landscape mode and appear to have fewer tokens on the board as a result. Content wise, you have plenty of reasons to collect all three. TOM is focused on sheer match three pleasure. 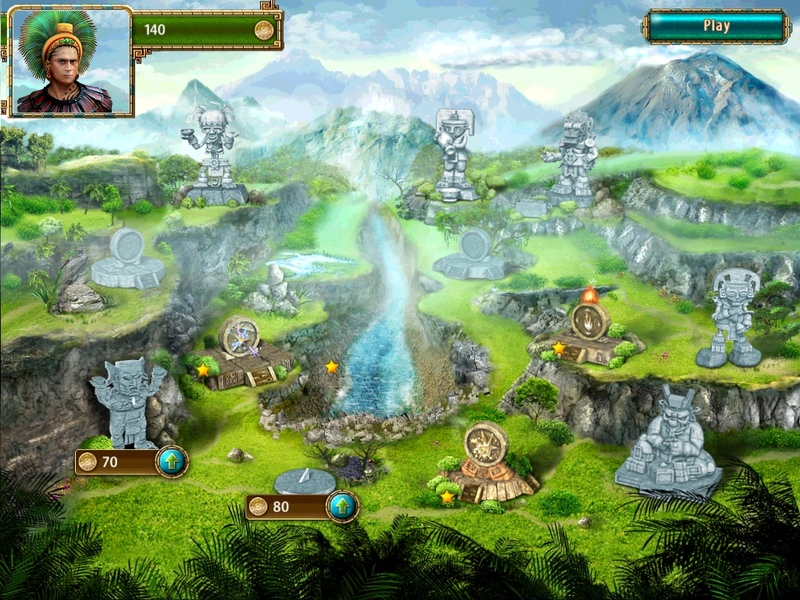 TOM 2 offers adventure, endless and puzzle modes and even a special mini-game at the end of each chapter. Of the three, TOM 2 has the most content. 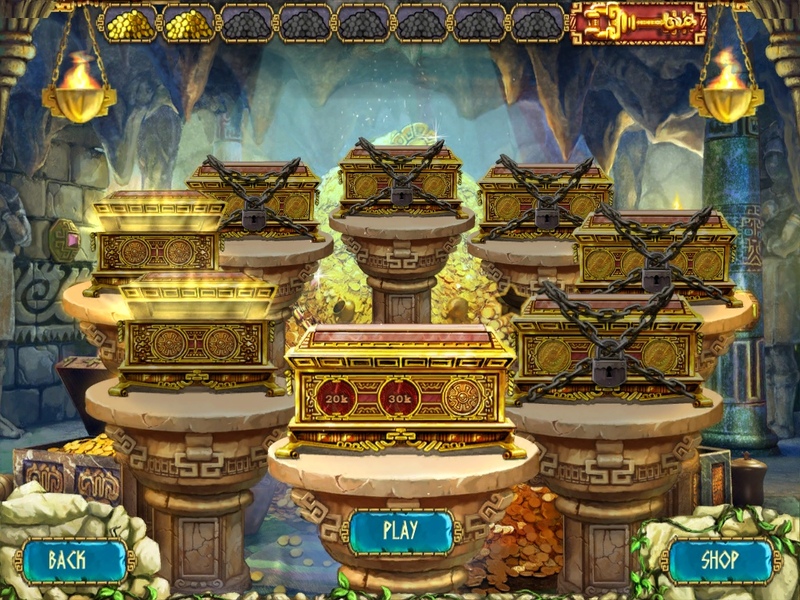 TOM 3, on the other hand, focuses on eliminating as many tokens as you can in order to unlock Montezuma’s treasure chests, with eliminating jeweled tokens as a bonus. 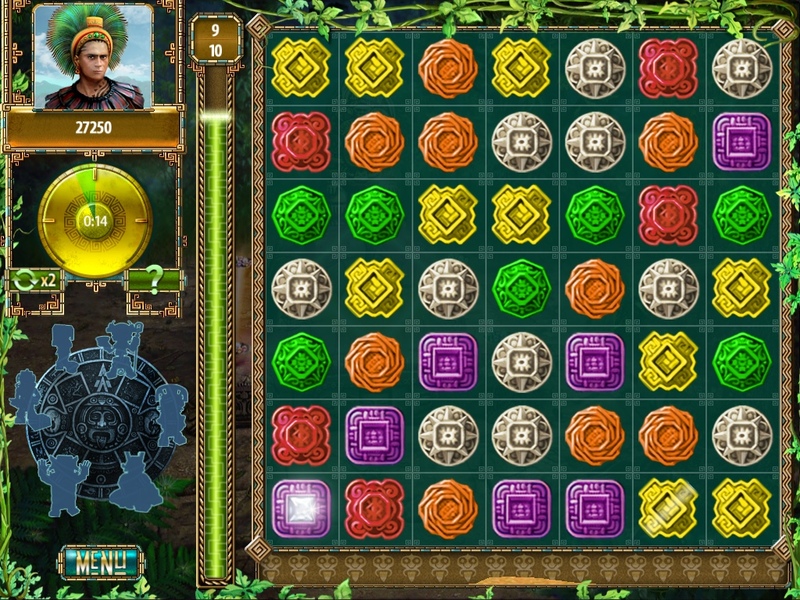 The puzzle aspect is built in, instead of a separate game mode as in TOM 2. On top of these, you can also play the game in hard or expert mode after finishing normal mode. The Treasures of Montezuma series proves that you can offer up new and exciting sequels different enough from each other and the original, and don’t just capitalize on the success of the first game. At the same time, the original is good enough to stand the test of time and should not be skipped. You can’t go wrong with this series. Newbies and match three veterans ought to have at least one Montezuma game in their collection.